We left Chiang Mai about a week ago, this time on our bicycles, to start our last week of cycling in Thailand before we enter Myanmar. As always it feels really good to be back in the saddle again, even if the first 100km heading South out of Chiang Mai are on a straight and very busy road. We make one interesting side trip to a museum dedicated to Ganesh, the Hindu god with the elephant head. A somewhat eccentric Thai believer has collected all kinds of statues, masks and other depictions of Ganesh from all over the world and put them on display in a garden. After this stretch things quickly get more interesting. From the small town of Hod we turn West, towards Mae Sariang. We climb over a range of hills but the gradients, the road and the traffic are altogether doable. We enjoy a couple of nights of camping and roll into the border town of Mae Sot where we will relax for a couple of days. Thailand is, apart from the steep climbs, one of the easiest countries we have cycled around in. Almost too easy, and where’s the challenge in that? We would definitely recommend it as a country for a first time bicycle tourer, as you can experience a different culture while not really missing out on the creature comforts from home. There are great bike shops that stock good components. You can put up your tent just about anywhere, and there are perfect (free) camping spots with cold showers and toilets next to gorgeous waterfalls, maintained by kind park rangers. The gold and glittering wats are beautiful. The people are super nice, and many speak English. Shops and restaurants stock food that we know from home. Despite the ubiqitous 7-11 and other Western brands there is a strong Thai cultural identity, and there is much on offer in natural and cultural sights. Most people think of Thailand as super touristy, but it is very easy to get away from the beaten path. The most beautiful spot we found in the last few days is the Mae Um Long Luang hot spring, just before reaching the town of Mae Sariang. We don’t find much info online apart from that there are two tubs with hot water. We make our way down a small road, then a dirt track, and end up at a rickety bamboo bridge over a river, with a real hot spring paradise on the other side. It is a large garden area built upon the hillside, with outdoor pools, bamboo huts, a cafe with cold beers and pot noodles. A local family runs the place and they make us feel right at home. The old man of the family looks a bit like a wandering monk, with orange elephant trousers, a wispy white beard and a line of dots tattood on his forehead. We can walk our bicycles through the riverbed so we don’t have to take the bouncy bridge across. There is a huge hot tub in a bamboo house just for us and a nice little camping spot overlooking the river. We spend the rest of the afternoon soaking our feet in the outdoor pools with Thai families. Hot springs are our favourite stopovers! Before getting to Mae Sot we conquer one more climb, over a range of hills that brings us down to the river that separates Thailand from Myanmar. This last climb is a lot tougher than expected. Some climbs hit 20% gradients which are impossible (for me at least) to pedal up. We hitchhike a short distance after we have climbed more than 1500m and the midday heat is burning us up. But, at the end of the day we sit at the verandah of a simple wooden hut, looking at Myanmar on the other side of the river. Life there looks different from life in Thailand, even from a distance. It is no longer just the women who wear the sarong (htamein in Burmese), the men don similar long skirts. People from the village across wash in the river, which looks like fun until you realize this is probably because they have no running water in their own home. I am currently reading The Glass Palace by Amitav Ghosh, a book about the recent history of Myanmar as told through the eyes of different generations of one family. It is hard to comprehend that Myanmar once was the richest and most developed of the South East Asian countries, until the British colonization and subsequent political mess plunged the country into poverty. Myanmar is a construct, an uneasy federation of different tribes who speak different languages and have different cultures and beliefs. They only formed a country to shake of British rule together, with an option to step out of the union ten years after it was formed. This option was conventiently scrapped by the Burmese government who sought to consolidate their power, with or without the consent of the different tribes and their states. One of the results of this ongoing state of internal conflict is a huge number of displaced Karen people who live along the Burmese border in Thailand. I had read about them before, in the well researched and poignant book The Invisible Ones by the late Dutch author Karel Glastra van Loon. Currently the Rohingya people are in the news because the Burmese army is blatantly harassing them in an effort to rid the (mostly Buddhist) country of this muslim minority. The story of the Karen people is equally sad but not so widely reported in the media. Back to The Glass Palace book. In the beginning of the book there are some beautiful descriptions of the tough life at teak logging camps some 100 years ago. There are English overseers and elephants and the wood is being transported to Yangon by wild mountain rivers in the wet season. The teak trees are true jungle giants that can rise straight up to 40m or more. It is a tree that loses its leaves in the cool season, and as we are cycling along the huge dry leaves are coming down around us, like big rustling brown paper bags falling out of the sky. It is strange to experience this falling of the leaves, which for us is so strongly associated with autumn and cooler weather. Here the leaves are falling but it is still well over 30 degrees. The leaves are used to make a traditional roof covering of the bamboo huts we see in villages along the road. The roofs look somewhat flimsy with their cover of brown leaves but they blend in nicely with the hills and tropical foliage. When we get close to Mae Sot we spot a large group of houses with these typical roofs. We stop to take some pictures and notice the houses are grouped very closely together, unlike the houses in the villages we have seen before. There are only narrow winding lanes between the houses and only tiny patches of vegetable gardens, it looks more like a rabbit warren than a village. We notice more as we cycle on. The ‘village’ stretches alongside the road for miles and miles and up onto the hills on our right. Mae La is huge, the biggest place we have seen since Chiang Mai, but built entirely of basic bamboo huts with teak leaf roofs. We notice it is closed off all around, by a simple bamboo fence with barbed wire. Every 500m there is a gate with Thai guards who wave at us and give us the thumbs up as we roll by. We see a sign that says ‘temporary shelter area’ and realize this is one of the Karen refugee camps. As Glastra Van Loon describes in his book, some of the people here have been here all of their lives, having been born in the camp. It was established in 1984. The Karen people can not go back to Myanmar for fear of prosecution by the government. In Thailand they are not allowed to work or study, so they cannot build a meaningful existence. They can only wait for change, which might not come anytime soon. The gross injustice that allows us to cycle by as we please and keeps them in limbo is unbearable. Someone asked us the question, but what are we going to do about it? Well, reading and writing about it and raising awareness is one small thing. We are on holiday but we are not closing our eyes for the less than pleasant things in the world around us. There are options to volunteer with the families in the camps here but also back home. I can recommend volunteering with Stichting Vluchtelingenwerk for instance and helping the Amsterdam refugees with language and integration into Dutch society. There are many small ways to reach out and let them know they are welcome, they are not invisible. The seasons are turning and the teak leaves are falling, even in the tropics. We recently booked our tickets to Japan, meaning that the end of the trip is coming closer. In little over a month we’ll land in Fukuoka, in the South of Japan. Another two months of cycling in Japan and we’ll be in Tokyo. We are in a contemplative mood and tentatively making plans for what happens next. But first, Myanmar. A friend of Cyril has generously offered us his home close to Inle lake, and we are eagerly looking forward to our time there. A home away from home, a place and a little bit of time to stop and think about what comes after this trip. After nine months on the road, spending 24/7 together, we decide to travel solo for a week. Thailand is well developed, geared towards foreign tourists, an easy country to travel around in. A perfect place for lone cyclists. We opt for skipping the obvious tourist attraction of the beaches and head North instead, towards the mountainous province of Mae Hong Son. Thus I venture South, skirting the big hills of Khao Ko national park before heading North. Cyril heads straight North, opting for less kilometres but more climbing on the way to Chiang Mai. Central Thailand consists of some long North-South ridges and those will have to be crossed if you want to get anywhere, but further South they are a bit less challenging. It is strange to cycle alone after such a long time together. Since I have a new phone I can listen to music again. I make longer cycling days because there is little incentive to hang around the tent or in a restaurant on your own. I break my personal longest distance per day record: 150km in fierce sunshine and on hot tarmac. I miss Cyril but I get a kick out of being a strong and independent solo cycling woman. Thai people are the smiliest people in the world so I never feel very lonely. People wave, give a big thumbs up, shout hello, and some even hand me water or powerdrinks as they are whizzing by on their mopeds. One night I camp next to the house of a lovely family. They let me use their shower and offer me food. I feel snug and safe alone in the tent. The only time I feel lonely is when I am in super touristy Sukhotai, surrounded by others farangs but not really connecting with them. Sukhotai is one of the old capitals of Thailand. Today it is a beautiful park dotted with ruins of wats, buddha statues, walls and moats. A very pleasant place to cycle around in, especially in the early morning. It is truly weird to see the person you’ve been cycling and traveling with ride off in another direction. After the initial shock I start enyoing my time alone. All of a sudden you decide everything yourself instead of discussing it. Where to eat, what to eat, when to eat for example. So yes it is easier in some respects, but I am not sure if I enjoy it more. My route takes me over several ranges that gradually get higher and higher. On the third morning of my solo adventure I decide to take a short cut. My trusty maps.me app shows a dirt path heading in the direction I want to go, it should save about 25 kilometres of climbing. Two things I don’t check well enough: the gradient of my shortcut and the condition of the path. At one point my ‘road’ disappears into a cornfield. As it is going downhill I just slowly roll on until I get to a thick jungle at the edge of the field. My ‘road’ should just be a few metres further, but all I see is big trees and unpenetrable bushes. There is only one way back: up that steep hill, through the cornfield. It is one of these moments where you curse the 20 kilos of luggage on your steel bicycle. After an hour or so struggling through the field I find my path. A few super steep parts further and I arrive at the last hurdle: a small stream where according to the map a bridge will take me to the other side. Of course the bridge is gone. In its place is a rickety construction made of bamboo and old tree stumps. Bag by bag I balance across to safety, saving my bike for last. In true cyclocross style I shimmy over the ‘bridge’, step by small step. Relief and pride fill me when I finally see tarmac again. During my solo week I visit Phrae, Lampang and other smaller towns. The heartland of Thailand sees few travellers and has a very laidback atmosphere. Just like Vera I experience many acts of hospitality and friendliness. A couple of Thai I have never met before take me out for dinner. Reaching Lamphun means I will see Vera again. The last climb I am flying, eager to meet her again and continue together. After our solo week we meet up again in Lamphun, a charming but surprisingly untouristy town just South of Chiang Mai. The town was the capital of the Haripunchai kingdom and built by queen Chama Thevi. As I am strolling around the old town I find a troupe of young girls in traditional wear performing a temple dance in her honour. 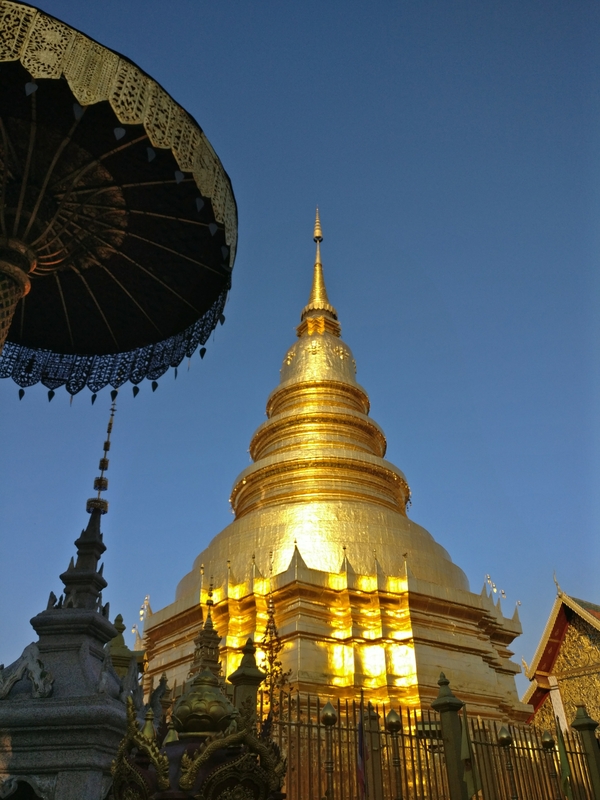 There is a revered wat with a beautiful golden stupa. Devout Thais slowly circumnavigate the stupa, chanting and carrying flower offerings. Lamphun is small but has some other interesting sights such as a well preserved city wall and moat, old teak houses and a food market. Most of all I love how it is undeveloped and as yet not discovered by mass-tourism. 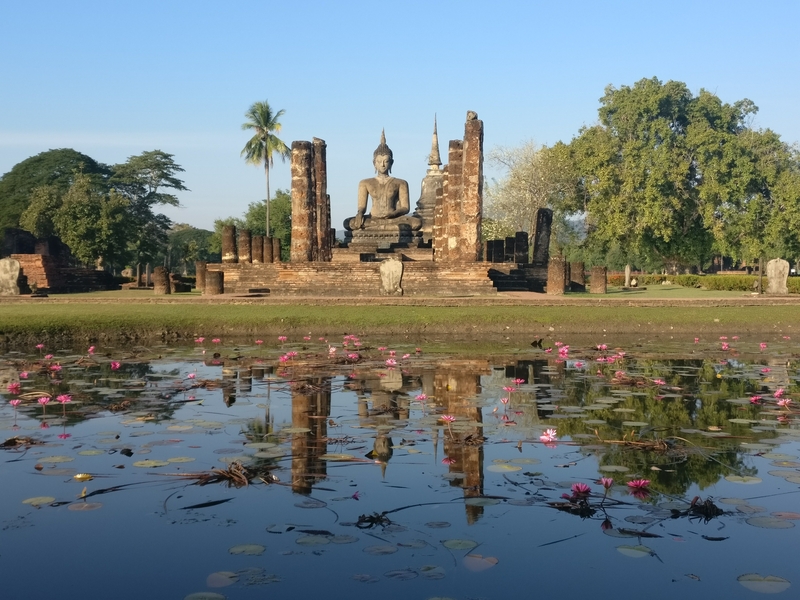 From Lamphun it is a short ride to Chiang Mai, the former capital of the mighty Lanna kingdom from around 1300 to 1800. We take the old main road, a narrow two-way lane flanked by giant hardwood trees adorned with yellow and orange ribbons. 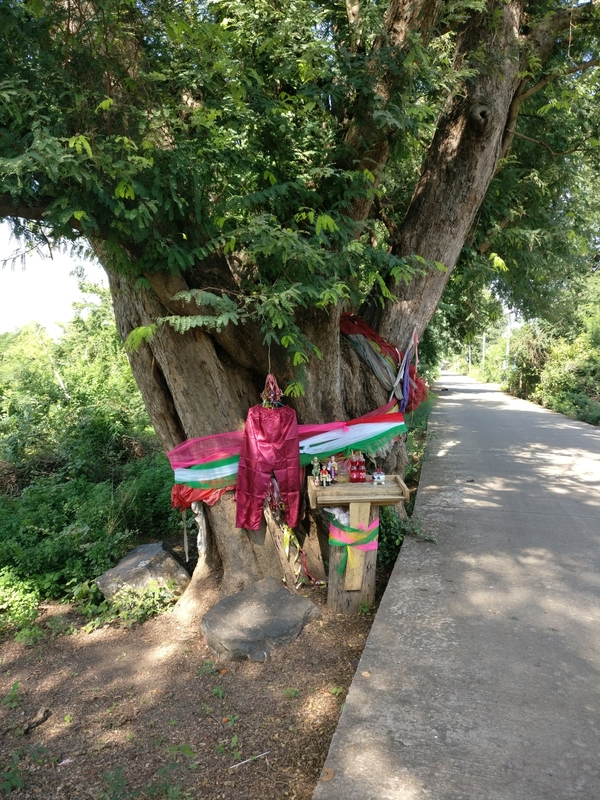 All over Thailand we find these trees, with multicoloured sashes, little ghost houses and offerings of water, rice and incense around them. This indicates that the Thai believe these particular trees are inhabited by spirits. Chiang Mai was an independent princedom until it became formally part of Thailand in 1939. Just South of the modern city centre we explore some ruins of an older version of the city. Until halfway through the last century Chiang Mai was only accessible by a long journey through the jungle by elephant or ox cart. Now of course there are highways and train lines, making it the capital of the North and the second most important city of Thailand after Bangkok. In recent years the number of tourists has exploded, growing 10% every year since 2010. I do not recognize the city I visited 16 years ago, apart from the night market which is still selling the same souvenir tat, some of it quite nice. Thailand has a long running royal programme, initiated by the late king, that aimed to help developing communities in rural areas. This so-called OTOP programme (One Tambon, One Product) stimulated high-quality production of typical handmade goods such as textiles, silverware and basket weaving. Every village specializes in one kind of handmade wares. This ensures that traditional hilltribe skills and cultures survive and the villagers earn extra income by bringing these products to touristy places where they are sold for a decent price, like the Chiang Mai night market. Close to Chiang Mai is Thailands Northernost Mae Hong Son province. It is famous for its steep hills and diverse and remote hilltribes, including Tai Yai, Lawa, Shan and the famous long-neck Karen people. One very hilly road loops from Chiang Mai right around this province, closely following the Myanmar border. We leave our bicycles in Chiang Mai for some tender loving care at the fabulous Triple Cats bike shop and rent a couple of motorbikes. We tackle the ‘1000 bends’ of the Mae Hong Son loop powered by gasoline instead of musclepower, heading North towards Pai for an anti-clockwise tour of the 800km loop. The first couple days we find all the creature comforts a glampacker could possibly need. 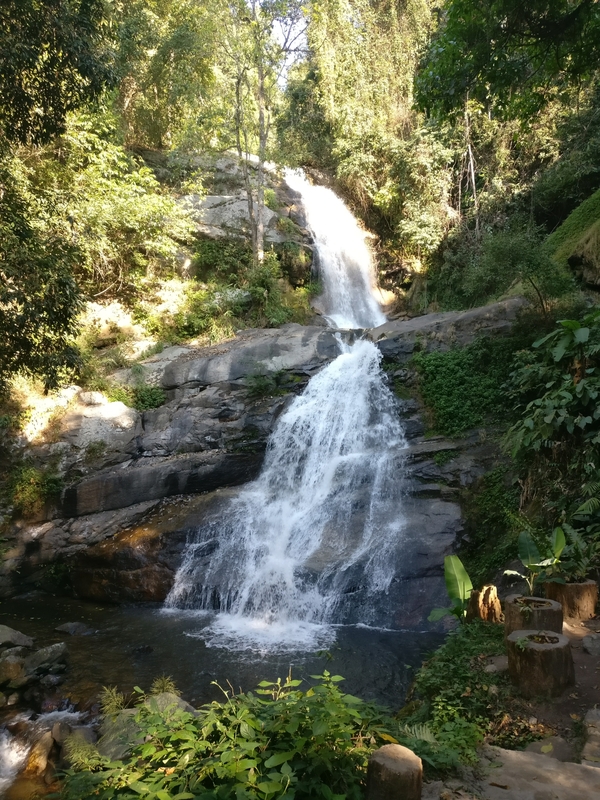 A funky hipster coffee place here, a hippy pad-thai restaurant there, American breakfasts, bamboo huts for rent in the stoner backpacker vortex of Pai and excellent camping places next to some beautiful waterfalls. We tackle about 500 of the 1000 bends in the steep climbs and descends around Pai and we are really happy not to be doing this with a fully loaded bicycle. Some of the inclines in the sharp bends approach 30% which is frankly insane. After Pai the road and scenery become more rural and less touristy. We visit the remote Ban Rak Thai village. The name tranlates as ‘the village that loves Thailand’ but it is in fact inhabited by Chinese. Kuomintang Chinese fled to this corner of Thailand after the communists gained power, and much of their Chinese culture remains. They grow excellent Oolong tea, serve Chinese food and live in Chinese houses with flying eaves. An odd place, even in this multicultural corner of Thailand. The provincial capital Mae Hong Son is a sleepy town where we only stop for lunch. We opt to spend half a day and the night at the nearby Tai Yai village of Pha Bong. Here is a hotspring and some ladies give us a great massage before we end up in the hot pool. In the evening the villagers flock to the pool to socialize and wash together. There happens to be a small village fest and I am invited to join the ladies on stage to dance. The steps of the circle dancing are not that complicated but I cannot match their graceful bendy hand gestures with my inflexible European hands. Still, they have fun at the sight of a farang who is at least trying and I enjoy the dance and the music as well. 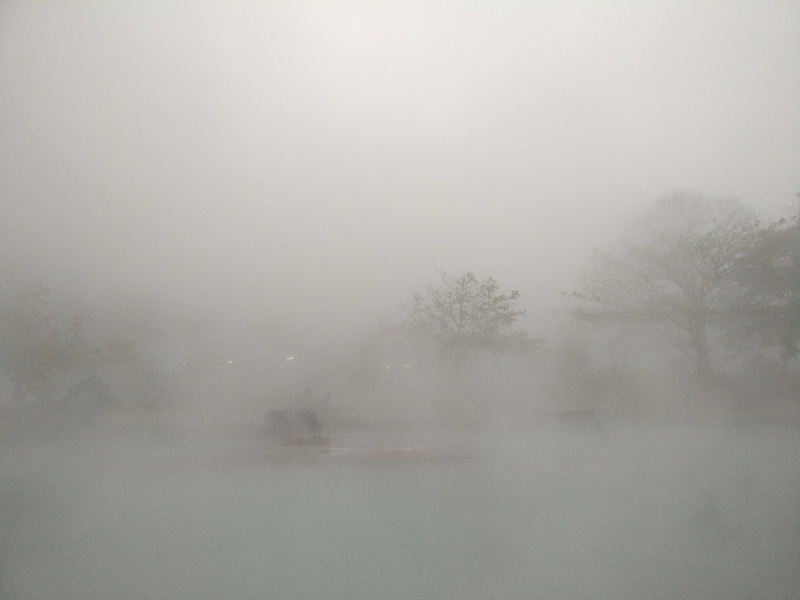 We camp right next to the pool and early in the morning we swim in the warm water, surrounded by mist rising from the hot spring. Another interesting and unexpected stopover is in the village of Khun Yuam. This place played an important role in the second world war, when it was a base for Japanese soldiers traveling to fight in Burma. Thailand was a Japanese ally and the villagers were therefor treated well, and a lasting friendship between the Khun Yuam people and the Japanese developed. There is an excellent museum that tells the story of this relationship and of the different hilltribe cultures and customs in the region. It is unbelievable to realize that less than a hundred years ago this place was only accessible by bamboo raft, ox cart or elephant. Roads were not built until around 1950 and the use of elephants was only phased out around 1970. The small town of Mae Sariang is the Southernmost corner of the loop, and from here we take an alternative road, a shortcut away from the main loop. 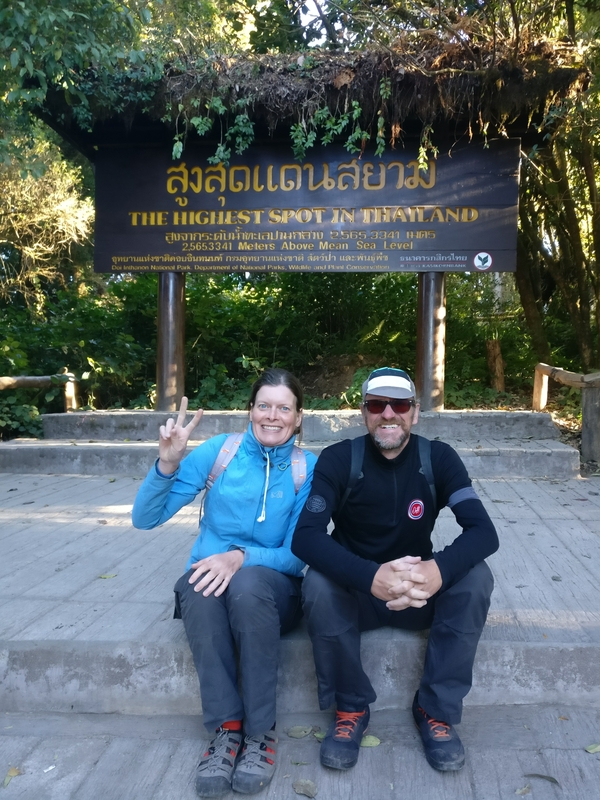 We climb to the 2560m summit of Thailands highest mountain, Doi Inthanon, and spend another night camping near a waterfall. 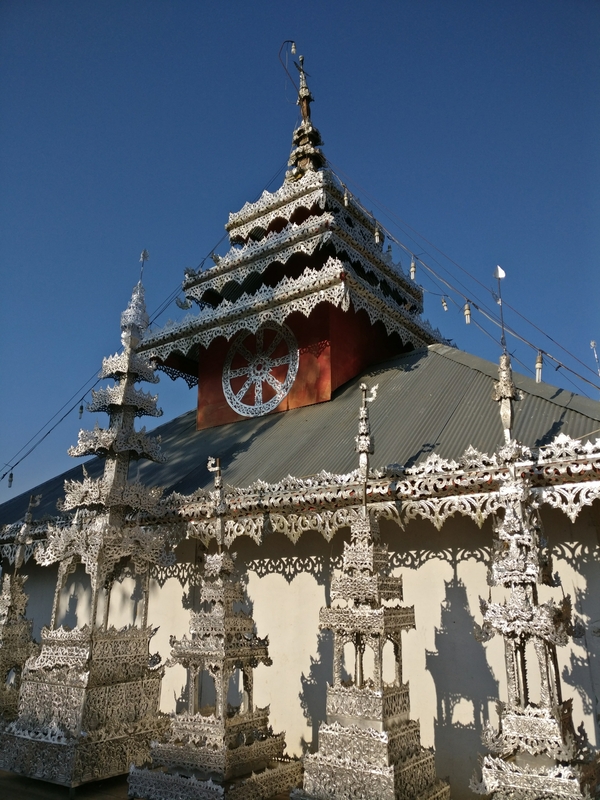 All along the Burmese border we find beautiful wooden Tai Yai temples with stacked angular roofs adorned with hammered metal filigree borders. They are very different from the Central Thai temples with steep roofs, mirrored tiles and naga (snakes) figures along the roof edges. One such Tai Yai temple can be reached by crossing a long and meandering bridge made of woven bamboo matting. When we get there local kids are practicing their performance, banging drums and getting into a dragon dance. They try to scare me but can’t stay in their dragon role long enough, and the dragon soon breaks apart into two little boys. A girl is dressed up as a peacock, with an elaborate tail fanning out from her back. Our shortcut via Doi Inthanon takes us through small villages where people are still very surprised to see farangs, even if we are less than 100km from super touristy Chiang Mai. We have one totally random surprise meetup with some SE Asia Rapha people who are doing a recce of the Mae Hong Son loop for an upcoming ride. After 7 days, more than 800 kilometres and definitely more than a thousand bends we are back in Chiang Mai where we get to hang out with our cycling friends Eric and Cathy and Sanjay, ‘the worlds fastest Indian’. We pick up our bicycles. My Rohloff hub is whirring along nicely after a much needed oil change. We liked the motorbikes but prefer the bicycle: we love the silence, we love the pace, we have to focus less on the road and can pay more attention to the surroundings, there is no need for gasoline, it’s easier to stop, look around and take pictures or talk to people. We are currently preparing for the ride down to Mae Sot, from where we will cross into our next country: Myanmar! Tomorrow we will set off, very happy to be reunited with our bicycles. …got published by the international cycling hospitality network warmshowers.org in their newsletter. You can read the full story here.